The victorious Flyers shake hands with the Friars. The dust had settled. The rain tapered, but the turf remained drenched from hours of downpour during a competitive, well-matched championship affair of 90-plus minutes. Everything was left on the field, but a victor had not been named: the game was tied 1-1. In this hard-fought championship game, ten penalty shots would decide a victor, either the Chaminade Flyers or the St. Anthony’s Friars. Before Chaminade’s junior varsity unit could arrive at this moment, however, it had to build a strong foundation of skill and teamwork upon which a successful playoff performance could be built. With a 7-1-1 record entering the semi-final matchup versus St. John the Baptist, head coach Mr. Gabriel Ramos ’04 believed he had just that. Benjamin Szemerenyi ’19 beats a defender and goes on a rush during his four goal night. Benjamin Szemerenyi ’19 led the charge in a stellar four-goal performance, adding an assist to his ledger as well. However, the high-scorer pointed out that he should not be given all of the credit. “We played well as a unit,” Szemerenyi commented. “I couldn’t have scored without my teammates.” Three of the Flyers’ nine finishes were assisted by Rafael Achury ’19, who found the back of the net himself. 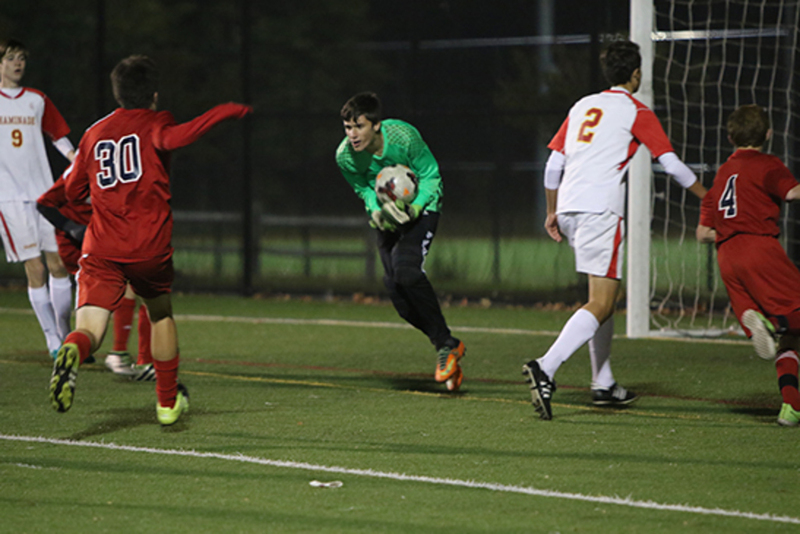 Beyond the stellar play of these two offensive powerhouses, the Flyers were backed by a near-shutout night from goalkeeper Andrew Hammersley ’19, whose effect on the playoffs would extend to the penalty shootout two days later. On Thursday, St. Anthony’s awaited a team riding high on the heels of its blowout semi-final victory in the championship game. The Friars, better prepared and always a tough test, struck first with a goal early in the first half. Despite this setback, team manager Miles Ventura ’19 knew the Flyers would rally together in their comeback effort. “We have been together for two years. We are like a family, and we stick together especially when we struggle,” he said. The Flyers delivered on that chemistry, managing an equalizer late in the game. Matthew Meneses ’19 scored the goal to tie the game, saving the sophomore squad’s season from spiraling to an undesirable finish. Andrew Hammersley ’19 makes a save to stop the Cougars’ offensive in the semi-finals. An extra time period was then set to crown a champion. Fate would not yet allow for this, however. In what Coach Ramos called play “with heat and grit,” the Flyers pushed the game to a penalty shootout against St. Anthony’s. The team’s shooters finished three penalty shots to emerge victorious behind stout goalkeeping. Hammersley saved all three Friar attempts, sealing the season on the highest imaginable note – a championship victory to boot an impressive effort. Since claiming the title, the JV Flyers are expected to flourish at the varsity level. They bring with them not only a great deal of skill but also the chemistry required to succeed. 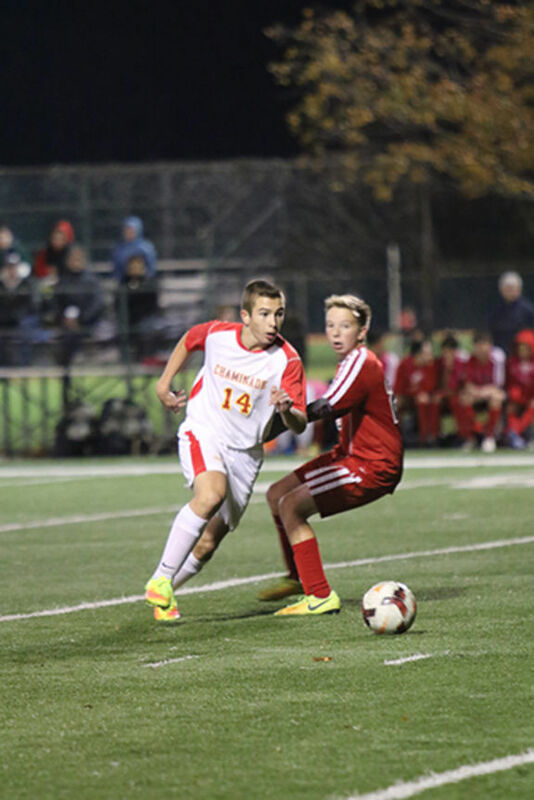 As the varsity program prepares to endure stiff competition in the chase for a trophy of its own, a budding sophomore group waits in the wings to strengthen Chaminade’s rising soccer program. Posted in Sports and tagged championship, flyers, jv soccer. Bookmark the permalink.